A new year sparks New Year's resolutions, and financial resolutions are typically popular ways for people to try to improve their lives in a new calendar year. As part of the POPSUGAR Insights 2017 Personal Finance Report, we surveyed nearly 2,000 women between the ages of 18 and 44 to ask them how they manage their finances and think about their financial future. 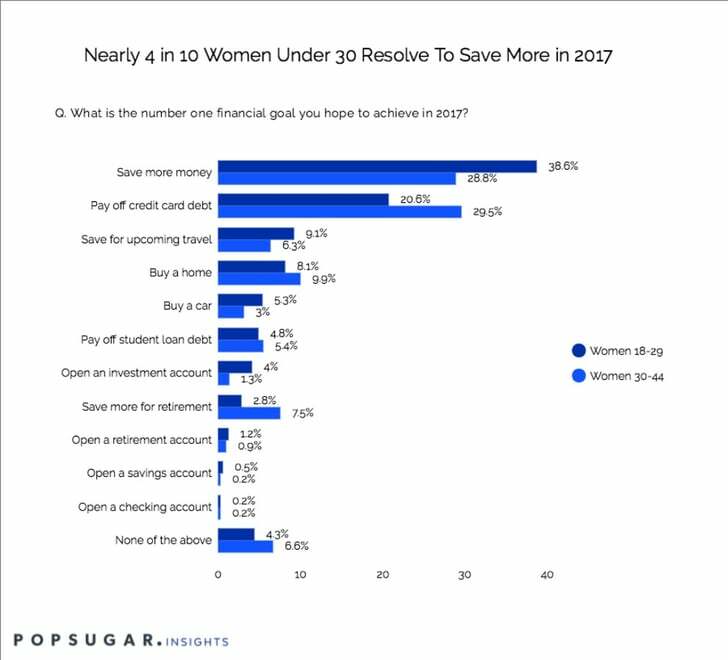 Women under the age of 30 say their number one financial goal for 2017 is to save more money. They are 34% more likely than women aged 30 to 44 to cite saving money as a goal. Women over the age of 30 say that paying off credit card debt is their primary goal, and they're 43% more likely than women under 30 to have this as a goal. By reviewing the results of this question, the priorities of each age group becomes quickly apparent. Whereas women under 30 are 44% more likely to want to save for upcoming travel, women between the ages of 30 and 44 are 22% more likely to be saving to purchase a home. While women under 30 are 76% more likely to want to buy a car, women between the ages of 30 and 44 are 167% more likely to want to save more for retirement in the new year. Each of these goals are personal, and financial goal planning is a very individualized exercise, of course, but by looking at these 2017 goals in aggregate, they reveal interesting aspects of the life stage of each age group. Women under 30 seek to travel more, buy cars, and save more overall, whereas women between 30 and 44 seek to reduce debt, purchase a home, and save more for retirement. Brands can help women keep their resolutions throughout the year by creating content that offers both annual and seasonal tips to help women take positive steps towards achieving the goals listed below. In terms of increasing savings and reducing debt, brands can look to key times during the year where financial goals are at the forefront (tax season, holidays, etc.) as well as identify less traditionally financial focused-times to gently remind women to stay on track towards achieving their goals. Brands can also develop tools to help women track their goals and tie those goals to more immediate and personal rewards, a sort of financial mindfulness that makes financial health as important as overall personal health. By doing so, financial goals become a part of a woman's overall healthy living goals, providing them with the peace of mind that helps reduce stress while securing their financial future.